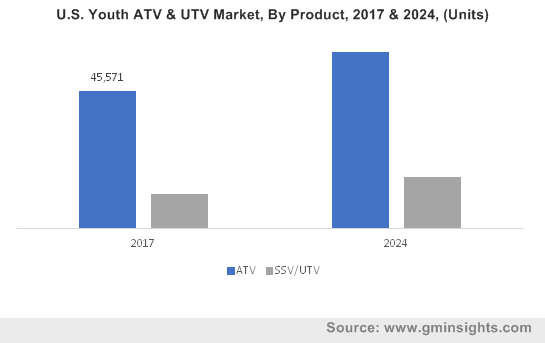 North America Youth ATV & UTV Market size was valued at over USD 245 million in 2017 and is estimated to exhibit over 6.5% CAGR from 2018 to 2024. Growing penetration of sports and recreational activities will drive the North America youth ATV & UTV market over the forecast period. Increasing outdoor parks and recreational facilities such as off-road trails are positively influencing the industry demand. Moreover, advancement in infotainment services in off-road vehicles including GPS tracking and Bluetooth connectivity to enhance consumer experience and safety will boost the industry growth. Proliferating sports events involving youngsters is playing a significant role in the North America youth ATV & UTV market over the forecast timeframe. International associations promoting multiple off-road racing events for amateur and professional drivers will positively influence industry growth. The competition mandates complete manufacturing and racing of UTVs by students without involvement of any professional engineers and designers providing a platform to promote their technical and driving skills. Rising overall disposable income is expected to drive the North America youth ATV & UTV market. In 2017, trail sports contributed over 13% of outdoor recreational spending. As per the U.S. Commerce Department, in 2018, the gross domestic product rose at over 4% annualized rate. Strong per capita spending across the countries will lead to increased participation in recreational activities, thereby supporting business penetration. Increasing accidents attributed to rash driving by juveniles coupled with ignorance of proper safety gear while driving may hamper the North America youth ATV & UTV market share over the forecast timeframe. However, government agencies across the region are actively promoting the certified training and safety programs and has laid down stringent regulations regarding the age limit and mandatory safety equipment while driving will positively influence the market share. ATV segment will witness over 3.5% CAGR during study timeframe owing to its compact size and high power/weight ratio that enables it for maneuvering in tight spaces. Increasing off road sports events such as National Motocross Championship, Championship Mud Racing (CMR) and Grand National Cross Country (GNCC) are continuously attracting more youth participants and support its dominance. In 2017, the UTV segment accounts for over 20% revenue share. The product will witness strong growth owing to multiple benefits over the standard youth ATVs such as improved safety features including the presence of seatbelts, roll cage, and windscreen. Rising popularity for off-road leisure activities including camping, adventure tourism, and trail riding will support the transition towards side by side vehicles. Gasoline held over 90% North America youth ATV & UTV market share in 2017 owing to higher power and reliability offered by gas-powered off-road vehicles. Ongoing technological innovations including automatic transmission to ease drive and vehicle control is gaining traction. Availability of diversified engine alternatives with varied power, torque, and cubic capacities will enhance the segment dominance. However, air pollution and noise generated from these vehicles may limit its growth over study timeframe. 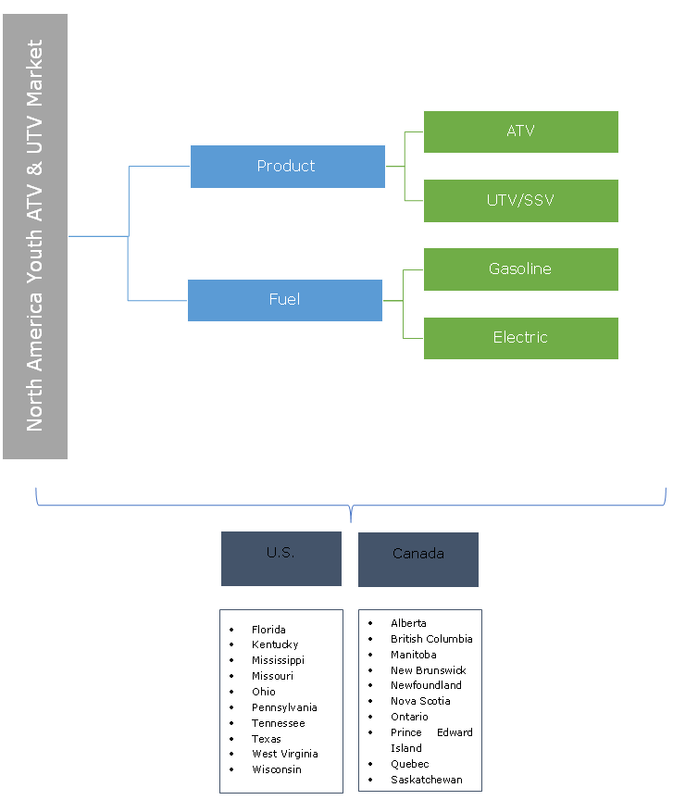 Electric powered North America youth ATV & UTV market share will register gains at around 7% with active support from the government to promote vehicles with cleaner emissions. Continuous product enhancement to increase power output will drive the adoption of electric off-road vehicles among youngsters. Further, affordable running cost coupled with low engine noise and lower maintenance will boost product penetration in next six years. In 2017, U.S. Youth ATV & UTV market size was valued over USD 220 million owing to presence of major industry players, including Polaris Industries, BRP, and Arctic Cat. The country has presence of over 150,000 miles of trails and around 430 wilderness areas providing ample space for recreational activities. The U.S. states possess large farms & ranches along with numerous unpaved roads that attract young generations for off-road leisure activities. For instance, Texas, Pennsylvania and Florida have around 70, 65 and 45 off-road trails respectively that will support its dominance and accelerate North America youth ATV & UTV market size over projected timeframe. Canada will witness over 4% CAGR with growing per capita disposable income. States including British Colombia and New Brunswick have witnessed over 3% increase in disposable income in past five years. Ontario holds major share owing to presence of organizations such as Ontario Federation of All-Terrain Vehicles (OFATV) and the Eastern Ontario Trails Alliance (EOTA) to facilitate young participants thereby positively influence North America youth ATV & UTV market share. Major North America Youth ATV & UTV market players include Arctic Cat, BRP, Hisun Motors, Honda Motors, Polaris Industries and Yamaha Motor Corporation. Other significant participants include All Wheels Canada, Apex, Apollo Motors, Bintelli Offroad, BMS Motors, DRR USA Inc., Kawasaki Motors Corporation, KYMCO, Mademoto, Rosso Motors, SSR Motorsports, Suzuki Motor Corporation, Tomride, USA, Motortoys, and Venom Motorsports. Industry players are strengthening their manufacturing capability to enhance their market share. In December 2015, BRP announced an investment of USD 118 million in its Valcourt manufacturing site for better material flow, decreased set-up times, inventory reduction, and modern technologies to reduce the manufacturing costs and create the value for customers. Further, the market participants are expanding their product portfolio to serve larger consumer base. For instance, in October 2018, Polaris Industries introduced ACE 150 EFI for 10 year above age group. Growing availability and accessibility to off road vehicles will accelerate the market growth in next six years. North America Youth ATV & UTV market size is gaining traction owing to their rugged nature and ability to travel across difficult and rough terrains. Regulatory bodies including Consumer Product Safety Commission (CSPS), Off-Highway Vehicles Act, Texas Department of Motor Vehicles, Pennsylvania Vehicle Code, Parachute Canada and British Colombia laws regulate the safety aspect and new registration of vehicles in the market. CSPS regulates the safety aspects related to all-terrain vehicles including driver safety, engine size, and age limitations. Further, the commission promotes the usage of safety helmets with proper certification including the American National Standards Institute (ANSI) Z90.1 or ANSI Z78.1 standard covering various aspects of the facial safety and the presence of the facial shield.